Classically inspired with contemporary design details, we’ve taken comfort to the next level with deep, soft cushions and sumptuous pillows. Meet Briony. With a choice of a Standard or Pillow Back option and seat fillings of either Fibre or Feather-Wrapped Foam, Briony is not only elegant but versatile too. 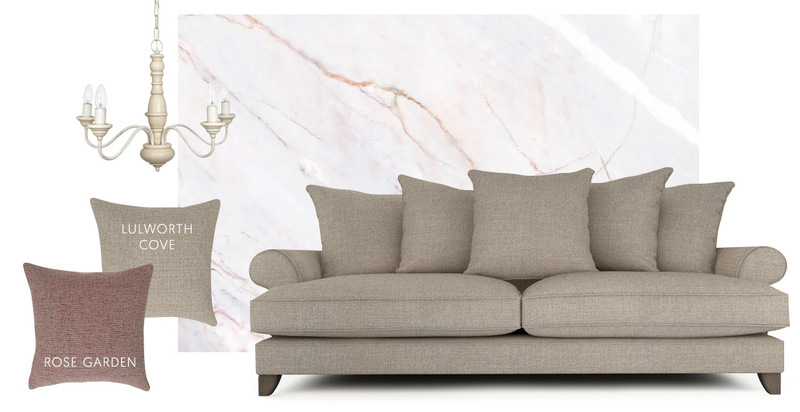 Available in range of sizes to suit your lounge, you’ll find the Standard Back Sofa in a 4 Seater, 3 Seater, 2.5 Seater and Snuggler. The Pillow Back version is available as a 4, 3 or 2.5 Seater. As the perfect finishing touch you’ll also find a Briony footstool, designed to perfectly complement the sofa. Watch the video to discover Briony in all her glory or download the range card for information. A Pillow Back Sofa is something new at The Lounge Co. We love it because it adds an air of casual comfort to a traditionally-inspired sofa. Even better, you can choose a contrasting fabric for the reverse of the cushions, meaning even more versatility. From left to right: Tumbled Linen - Little Haven and Paradise Bird - Mulberry, Velvet Touch - Quiet Fawn and Urban Tweed - Hawthorn Avenue, Vintage Velvet - Walled Garden and Scion Metsa - Pacific, Family Friendly Basket Weave - Mustard Flower and Velvet Touch - Golden Spice. 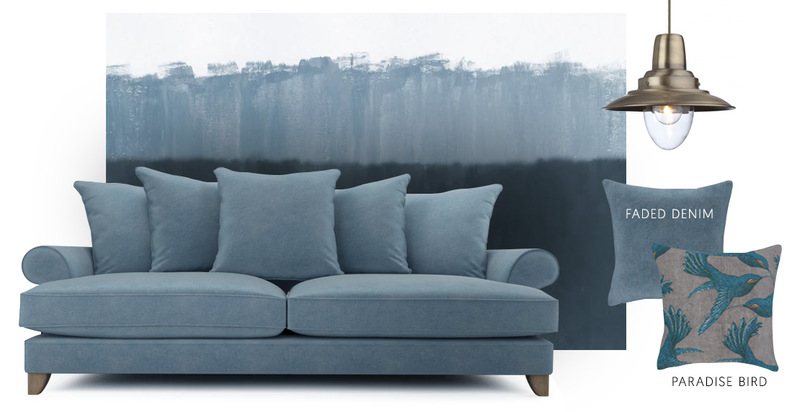 To choose a different fabric for the back of the cushions, simply email our lovely team at customercare@theloungeco.com who’ll be able to put your Briony order together for you. With over 100 fabrics to choose from, including our new ranges of Tumbled Linen and Urban Tweed, you’re guaranteed to find your perfect shade. Make a start by getting up to 8 fabric swatches delivered for free. The fabric you choose can make a big difference to Briony’s looks. 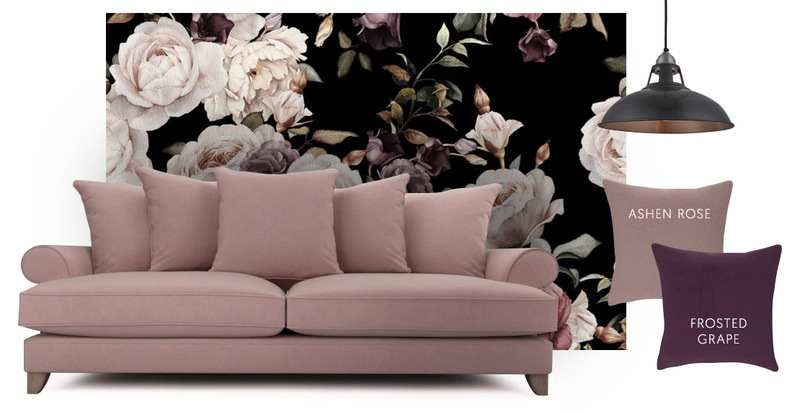 We’ve put together some looks based on interior trends for Autumn/Winter 2018. Which is your favourite? Take our brand new House Velvet - Ashen Rose - a perfect blush pink. It’ll give Briony a feminine touch without being sickly sweet. Give the the look some drama by choosing a dark velvet for the reverse of the pillows and setting against oversized bold florals. Neutrals are a wise and timeless choice. Briony looks effortlessly elegant clad in our new Tumbled Linen - Lulworth Cove. Add touches of marble to level up the sophistication. We’ve taken the subtle pinks from the marble and matched it to our new Urban Tweed - Rose Garden for the reverse of the cushions. If you’re looking for something stylish with a hint of vintage, denim blues are big this season. Vintage Velvet - Faded Denim will add softness and understated colour to Briony. We’ve added a bold pattern; Paradise Bird - Grey to the back of the pillows. Finish the look with painterly textures and vintage metals. Discover the complete Briony range and add some classic comfort to your lounge.